Aboard a westbound United A319 yesterday, I had the pleasure of listening to ATC communication on Channel 9. At 38,000ft, Salt Lake Center advised us to expect opposing traffic 1000ft lower at 12 o'clock. 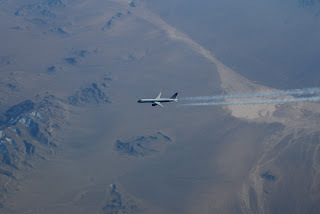 I readied the camera, and caught UA14, a Boeing 757 flying SFO-JFK. FlightAware showed the location over Utah and the speeds of both aircraft. This 757 is 47.3m long; closing at 1044mph, it was abeam for just 0.101 seconds. It was amazingly fast! I left a note to the first officer who was on the radio, thanking him for sharing Channel 9 with us.